The next Rock Band may actually live up to its promise and teach you how to play music—or at the very least, learn how to play selected songs from the Rock Band 3 soundtrack. Thanks to Rock Band 3's new Pro mode for guitar, drums and, yes, keyboard, every single note on the game's song list will be tracked. Developer Harmonix showed this beyond-expert level mode at a pre-E3 event along with its new keyboard controller and the new 102 button, six string Fender Mustang created by peripheral maker Mad Catz. While we didn't get a chance to test it, Harmonix and Mad Catz will be releasing a three cymbal expansion set the Rock Band drum controller, with cymbal hits accurately mapped to that expansion in Rock Band Pro mode. Rock Band 3's new two-octave keyboard controller is the most natural feeling music peripheral of the bunch. It feels no different from an entry level electronic keyboard, sporting 25 keys and a MIDI output along with standard controller buttons and a handle that will let you play in the keytar style if you choose. Just like The Beatles: Rock Band, Rock Band 3 will support 3-part vocal harmonies in some songs. The good news for actual musicians? If you already have a MIDI keyboard or MIDI drum set, you can opt for the Rock Band 3 MIDI Pro Adapter Box. The device will convert MIDI messages into console controller data and includes on-board console navigation buttons that will let players navigate the game's menus. While many of the songs available in the demo version of Rock Band 3 that we played featured keyboard parts, like Night Ranger's "Sister Christian" and Huey Lewis and the News' "The Power of Love," for songs that don't have a keyboard line, Harmonix says that players will be able to play guitar or bass parts on the peripheral. Picking up the keyboard is simple. In standard difficulties, players need to mind five keys, color coded to the appropriate notes on the familiar Rock Band note highway. The keys themselves are easily identified with a colored strip that spans those five keys. In Pro Mode, however, the entire keyboard is fair game, with a second color-coded strip on the controller that spans the entire keyboard and color indicators on the note highway that shift left to right indicating the required position. While Harmonix reps say they expect to have all of Rock Band 3's songs transcribed for Pro Mode difficulty, its plans for back catalog titles, like the keyboard heavy debut album from Boston, are still up in the air. Reps indicated they didn't want to re-charge players for older songs. Just as intriguing as the potential to genuinely learn how to play Rock Band 3 songs on a keyboard controller was the game's brave new guitar controller. With 17 frets and six strings, the Mad Catz created controller features an astounding 102 buttons built into its neck. Harmonix showcased a demo of Dio's "Rainbow in the Dark" in Rock Band Pro mode, which, in a word, looked insane, each fret, each note seemingly accurately mapped for play. 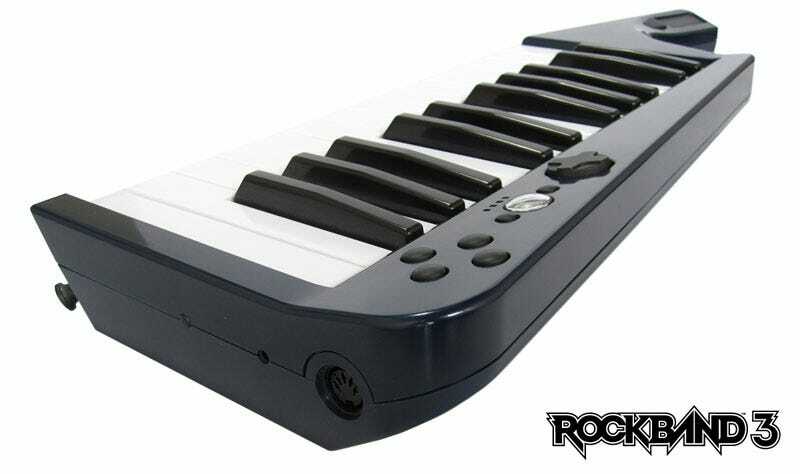 The Rock Band 3 Fender Mustang Pro guitar controller is, like the keyboard, a fully functional MIDI controller. We got a chance to go hands on with a prototype of the device, exceedingly clear that it was a prototype. The strings on the Pro guitar controller felt soft and realistic, while the fret buttons felt soft and spongy when depressed, capable of providing the necessary tactile feedback when presented with 102 buttons. While it's doubtful that the Rock Band 3 Fender Mustang Pro guitar controller will, alone, teach anyone how to play the guitar, it looks like a solid learning tool. Since it will accurately map individual notes and chords, players can learn the basic chord progression and riffs of their favorite songs, thanks to Rock Band. Who needs tablature or the skill to actually read music? OK, you may eventually need that, but it's a good foundation. On the software side, Harmonix is making it easier for players to get in and out of Rock Band. In the third major iteration, Harmonix is including full drop in, drop out play in every mode. Every user has their own menu in Rock Band 3, designed to avoid the confusing stumble of navigating the game's menus, which could be manipulated by anyone in previous versions. At any point, an individual player can modify his or her difficulty options without interrupting the group. In Rock Band 3, Harmonix is also making it easier to navigate a massive library of songs, letting players set up filters based on song length, game, number of vocal parts, decade of release, genre and more. Players can also create and edit set lists, share them and compete in set list battles, which can be issued to other players via Facebook and Twitter. Rock Band 3's other main modes include Career, which Harmonix claims will focus on skill, not a grind, and Road Challenges, which were pitched as "Band World Tour meets Mario Party." MTV Games and Harmonix plan to ship Rock Band 3 with 80-plus songs on the game disc with songs from previous versions easily importable. Rock band 3 is due for release sometime during the holidays of 2010. For another look at Rock Band 3's interface and visual style, check out the gallery below.